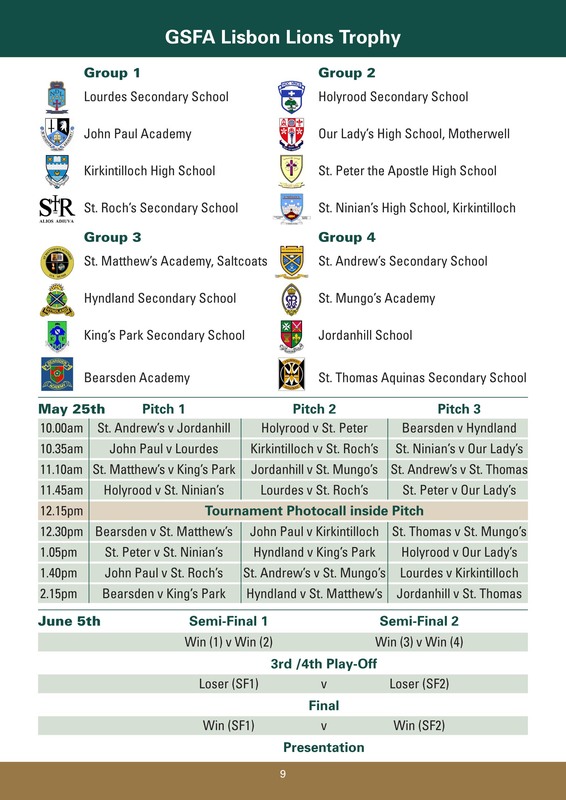 Our Lady’s is honoured to be one of 16 invited to participate in the GSFA Lisbon Lions Trophy on May 25th. The GSFA in association with Hyndland Secondary School, Celtic Football Club and Glasgow Life, are pleased to announce a competition to honour the 50th Anniversary of the European Cup triumph of Celtic FC., the first Britsh side to win this most prestigious trophy with a team made up entirely of players from the West of Scotland. Our Lady’s has a close connection with the team, with three former pupils in the squad (Billy McNeil, Bobby Murdoch and John Clark). We wish our current players good luck in the tournament. Josh Barr, Martin Boyle, Niall Burke, Ryan Bourke, Joe Chambers, Aedan Dunne, Daniel Grew, Henry Kyanda, Billy Mackay, Josh Miller, Paul Murphy, Callum O’Hara, Luke Robertson, Adam Stevenson. Click ont he image below for a larger version. OLHS annual Champions League is taking place on Friday 19th May at Firpark. Please add your name to the lists in PE if you are interested in taking part. Teams will then be displayed in due course. Thanks. Bayern Munich: Patrick Pender (GK), Michael Verrecchia, Euan Whitehead, Raymond Ron, Luke Dickson (C), Dean Quinn, Mateusz Cymerman, Michael Caroll, Liam Campbell. Paris Saint Germain: Chris Wilson (GK), Kieran Etherson, Matthew O’Neil, Conor Boyle (C), Marc Hobson, Michael Docherty, Reece Cathcart, Michael Costello. Atlético Madrid: James Low (GK), Jon Joe O’Hanlon, Nathan Harbinson, Kenny Barr (C), Marc Crossan, Eryk Gnylewicz, Chris Reid, Connor Lynch, James Murphy, Evan Murphy. Borussia Dortmund: Daniel Collins (GK), Marcus Groome, Kieran Leary, Ugonna Eriugo, Kian Marshall, Ronan Winton, Stephen Black, Paul Giwa, Chris Comerford (C), Wiktor Witkowski. Real Madrid: Anthony Campbell (GK), Robbie Payne, Liam Milne, Conor Mullen, Mark McSorley, Eric Katat, Mark O’Rourke (C), Marc Marley, Matthew Robertson, Reagan McAuley. Inter Milan: Ryan Kane (GK), Daniel MacLeod, Dylan Garmery, Geordan O’Brien, Euan Millar, Tony Weir (C), Adam Lynch, Ben Logue, Joe Lester, David Nugent. Liverpool: Jamie Lester (GK), Paul Devlin, Nicholas McNally, Ryan Murphy, Shane Divers, Tommy Brierton, Aidan Burke (C), Connor Nisbet, Rhys Clarke. Arsenal: Johnathan Rolwich (GK), Andrew McMahon, Bryan Boyle, Johnathan Sneddon, Joe McNally (C), Nathan Todd, Sean Cassidy, Paul Bradshaw, Connor Scullion, Michael Forsyth. AC Milan: Ryan Nisbet (GK), Mark Ross, Aidan Beggs, Declan Sloan (C), Eamon Higgins, Adrian Monka, Liam Tonner, Connor Schuel, Greg McCluskey, Mark Kelman. Barcelona: Mr McGrath, Mr Weir, Mr McHugh, Mr McLaughlin, Mrs King, Mr Sanza, Mr Macmaster, Miss Simpson (CC), Luisa McDonald, Kara Reid, Mystery Guest. Congratulations to our Under-14 footballers who beat Coatbridge High School 4-2 last week with a hat-trick from Eammon Higgins, and another goal from Adam Lynch. We a re also delighted to announce that Luke Dickson and Aidan Burke have successfully made it into the Lanarkshire squad for under 15….fantastic achievement when you think of the amount of boys who tried out for this! Under-13, U14, U15, U18 and girls’ football teams have been selected and play their first matches this week. We are also delighted to announce that five of our boys have got through the North Lanarkshire trials and are now trying out for the Lanarkshire schools team. Congratulations and good luck to Jamie Lester, Luke Dickson, Conor Boyle, Aidan Burke and Kenny Barr. S1 football trials will take place next week. If you are interested in taking part, please add your name to the list on the PE noticeboard. S1-3 girls played a match against Coltness High on Monday. Despite an injury to Luisa McDonald and only being able to field the bare seven players, our girls played in a very one sided match, scoring ten plus goals. The girls were, as usual, a credit to themselves and the school. Well done girls! We look forward to the full 11-a-side match against the same school after Easter. Team: Niamh SImmonette, Sammi Marshall, Kara Reid, Lauren Whitehead, Olivia McGarry, Skye Elliot and Emmajai McCReaddie. OLHS Champions League took place at Firpark this week with 6 teams competing. Each team had 2 boys from S4, 5 and 6 along with a member of staff. The games were very competitive and all players did really well. The winning team were PSG and were presented with the trophy by Mrs Sinclair at the end of the tournament. The winning team consisted of Matthew McGowan, Daniel Leonard, Luke Easton, Sean Hopkinson, Robbie Mackie, Jonny MacLeod, Owen Hastie and Mr Brogan. Commiserations to our gallant Under-13 footballers who played in the final of the Lanarkshire Cup against Trinity High School last week. Although the team eventually lost 3-0, they played their hearts out and the school is very proud of their achievement in being runners-up. Our Under-15 girls 7-a-side team competed in the National final of the Cashback 7s at Toryglen Football facility on Wednesday 29th May. The girls had already made it through two rounds to get this far and as such, entered the finals as Central Region champions. On the day, Our Lady’s came up against two very strong sides, from Woodmill HS in Dunfermline and Bathgate Academy, losing to both teams. However, they managed to pick themselves up and defeat Irvine Royal Academy 4-0 to take fifth place in the whole of the country, beating out over 100 other schools. It was a great day and the girls performed and behaved exceptionally well. We’re sure further success will follow in the coming years! The final will be played on Monday 3rd June at Wishaw Juniors Park with a 7pm kick off. We are looking for a big support – tickets are £2 for adults and £1 for children and concessions. If you are going along you can borrow a school sweatshirt from the PE department to wear on the night. A sea of purple supporters would be great. The team have performed exceptionally well to get this far and a good support would make such a difference to them. So get along to Wishaw on Monday and support our wonderful team. The under-13 boys won their Lanarkshire Cup semi-final last night. 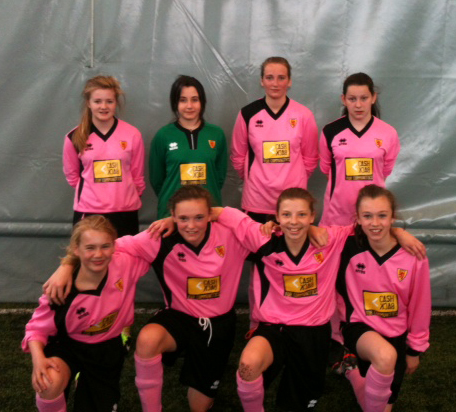 They beat a very strong Duncanrig side 4 – 2 on penalties after the game had finished 2 each. Mark O’Rourke and Conor Boyle scored the goals. Penalties scored by Luke Dickson, Declan Sloan, Kenny Barr and Aidan Burke. Miss McGinness, Mrs Mulholland and the S6 Caritas Students visited Park Springs Care Home on Friday to deliver Easter eggs to the residents. The pupils also entertained the residents & staff by performing an Easter concert and service. Thank you to all staff and pupils who kindly donated the Easter Eggs. Congratulations to the Under 13 football team who secured a place in the semi finals of the Lanarkshire Cup last night after beating a strong Cathkin High team 4-2 on penalties. The match ended 3-3 with Cathkin equalising in the last minute but the boys held their nerve in the shoot – out to make it through to the semi finals. We are waiting to see who their next opponents will be for the match after the Easter break. Well done to all involved. Congratulations to the Under 18 Football team who defeated St. Aidan’s 7-4 in the quarter final of the Lanarkshire Cup last night. Hat-tricks by Frank Mukendi and Chris Cadden and another goal by Nicky Cadden sealed a comfortable victory. A large number of upper school pupils will be attending Easter School in Motherwell College to help prepare for the exams in May. As well as this there has been on-going support within the school at lunchtime and supported study after school in most subjects. There will also be an Art & Design Master Class for two days during the holidays. As well as this there is a Higher Chemistry immersion day on Thursday 11th April and two days of Chemistry support for fourth year pupils on Thursday 11th and Friday 12th April. A group of pupils organised a Charity Band Night in the school on Wednesday 27th March. The night was well attended by friends and family members. Jill McMurray and Callum Wilson started with an acoustic set. This was followed by Konner Millar-Brookbanks who performed a number of well known songs. Our ‘Battle of The Bands’ Group, Little White Truth, finished off with an excellent 45 minute set. Thanks to band members James Bennett, Jordan Mooney, Chris Bradshaw, Brogan Devine and Mark Costello. Almost £200 was raised for charity. There will be a Performing Arts show on Friday 22nd April where all of the pupils in the music department can showcase their talent. Tickets go on sale after the Easter holidays. Our football teams have had mixed results recently, with our U14 team winning well against Dalziel High School, but losing to Larkhall Academy a couple of days later. Our U18 team also played well against Cardinal Newman before losing 2-0. Mrs Mulholland and her Our Lady’s team travelled to Kirkintilloch on the 12th of January to play St Ninian’s in the second round of the Scottish Cup, hoping to get a result allowing them to advance to the next round of the competition. Throughout the first half, Our Lady’s appeared to be holding up very well, holding St Ninian’s at nil nil, while also putting on a convincing attacking show, repeatedly hitting the post, the crossbar, and also forcing stops from the opposing goalie. However, with five minutes of the first period to go, the deadlock was broken by a goal from the home side, and by the break, Our Lady’s were suffering from a two goal deficit. The second half of the match again showed many chances on goal, with the same pressure being applied forward, however, the Kirkintilloch side’s strength was displayed and culminated in another three goals, tallying the score to five nothing, before time up. During the game however, the away team were denied well deserved goals, only by quality goalkeeping, weather conditions, and sheer bad luck. While St Ninian’s were undoubtedly a very well organised, solid side, the Our Lady’s keeper PG Aiton proved to be outstanding for the visitors. Pulling off fantastic saves, PG was credited with great comments from the St Ninian’s coaches, impressing them, and doing Mrs Mulholland and Our Lady’s proud. A brilliant performance from the keeper on a day which produced a score which may make you think otherwise. All in all despite the poor result and exit from the cup, the performance gives a very promising outlook to the future. With League games lined up and a great attacking ethic in the team, Our Lady’s should be taking this as a step in the right direction, and start racking up the victories playing good, honest football. Sometimes, a defeat serves you better than a victory. On the back of a three two win in the cup against Wallace High in Stirling, the team took to Taylor High on Friday night in return to league action. With a reshuffled team which saw the keeper playing outfield in order not to aggravate a hip problem, and a sub drafted in due to the absence of a centre back, a different outing from that in Stirling was played. After a wait for the referee which saw darkness begin to descend over the park, the teams took to the hockey pitch in windy conditions. After Taylor won the toss, the match kicked off at twenty past four. The match began with Taylor quickly pressing forward towards the Our Lady’s box, resulting in a series of messy tackles, before a quick clearance by Katat. However this was retrieved by a Taylor man and quickly punted back in the box, only to be cleared by McDermott. The fast pace continued as Our Lady’s were suddenly on the counter attack. On the second minute mark, the scoring was opened from a header from right back Wilson after the ball was bounced about the box. The game then slowed down, but Taylor repeatedly tried to send down long balls, which led to many calls to get a head on it and not let it bounce from the coach. In the 16th minute, Our Lady’s found themselves with the best chance of the match so far. A strong header from Swinfen fell to Craig’s feet on the left flank. With a defender breathing down his neck, Craig did well to turn a high ball over his shoulder towards the byline and spin round to beat him to it. A low cross was then sent to Cullen inside the box, however, his first touch allowed the keeper time to come off his line to close him down. Taylor then began to come more into the game, their players showing to be very physical, pressurising and sending Our Lady’s into panic and sloppy defending. With players losing their men and getting caught out of position, a lack of communication was clear, and addressed by the coach. This pressure from the home side culminated in a great effort from twenty yards. Yet a great stretch from Smith pushed the ball beyond the goal, keeping the scoreline at one nil. As halftime approached, Our Lady’s stepped up a gear, playing far better, producing great runs into the box by Craig and Swinfen, however, too many touches again allowed the Taylor keeper enough time to come off his line in anticipation. Taylor again had another chance on goal, a swerving ball from the left corner edging just past the post by the wind. A minute before the break, a through ball from Cherrie to Swinfen was blown for offside, and the keeper’s free kick saw the end of the first half. While a long period of the half was dominated by the physical players of Taylor, the score remained at one nil for the visitors, an early header from Wilson separating the two. While great opportunities missed by Cullen may cost the team, the side are playing far better, with promising runs upfield, and better communicating at the back. After a five minute interval, OLHS began the second half quickly, with short, snappy passes leading up to Cherrie taking the ball into the box after great link up play with Cullen and a one two with Swinfen, before a well-timed tackle stopped the attack. The first change of the game came, as Murphy replaced Katat, immediately linking up and passing on instructions from the coach. Seven minutes later Carrigan subbed on for Sandford. The next few moments saw a free kick from the edge of the box for each side, Swinfen taking the first, which went over the bar, and a Taylor call for handball seeing the shot bounce off the underside of the crossbar into Smith’s gloves. On the 53rd minute, the equaliser came as a simple ball into the box was controlled and the strike was taken with ease. Seconds after, OLHS had the chance to regain their lead, with another free kick on the outside of the box. With shouts from the coach, “lower!”, Cherrie’s on target shot was saved and the game remained wide open. The game then saw McDermott booked for disagreeing with the referee, and Carrigan giving way for the return of Sandford. The 60th minute saw a Taylor strike pass under the crossbar, and land on the fallen roof of the net, however the visitors were granted a lifeline as the ref chalked it off. The remainder of the match saw Cherrie and Stewart booked, and Sandford making way for Murphy after going over on his ankle twice. After three minutes injury time, the game ended, a goal apiece. With cup ties and league games lined up, the Motherwell outfit will be looking to go one better than this hard fought outing. With a few players out of position, this may have affected the final result, however the coach and the players will be hoping to build on great runs and interplay which were shown by the strikers and the attacking midfielders, and tighten the defence up, improving communication and shutting down players quicker.